Affidavit of Service provided at no additional cost. Complimentary pick-up in the Greater Madison area. First attempt within 48 hours of receiving papers. Call (608) 849-6420 or fill out our form today for a professional process server in Wisconsin. Dane County Civil Process opened for business in October of 2003 in Madison, Wisconsin originally as JF Hyatt Process Service. After years of hard work and exemplary service we found ourselves regularly doing work for some of the biggest names in the industry. Our success has been hard earned and was achieved by being the very best at what we do, and that's provide our customers with a great value. We utilize the industry's latest technologies to get the most current and relevant information available. This enables us to have an incredibly high rate of success with minimal attempts of service, ultimately, saving our customers time and money. Often those savings are in the hundreds when you choose Dane County Civil Process over other process servers or local Sheriff's Departments. We work hard to provide our customers with outstanding service at the best possible price. For ten years we have been successfully serving the needs of some of the largest and most successful companies in Wisconsin. But that's not to say we're too busy to work with the one time customer. We're diligent, creative, and persistent. We will get the job done. First attempts are made within the first 48 hours of receiving the papers. We provide simple billing based on flat fees without any confusing mileage charges. Rush and Express Services are also available. "I use David Overlin of Dane County Civil Process almost exclusively for service of process. David is very diligent in getting the service performed quickly and correctly. We ask him to personally serve individuals and often have very little information on how to find them. David is able to locate people and his perseverance in getting them personally served is outstanding. "-Cindy Woodward, Legal Assistant, Habush, Habush, & Rottier S.C.
"I would say that I've used Dane County Civil Process for 8 years and they consistently do a fast and accurate job. They handle the people who do not want to accept service very well, and they keep trying until they get the job done. Not always an easy task! They are pleasant to work with, and they are always willing to do a rush job. "-Sara Daye, Paralegal, Peterson, Johnson, & Murray, S.C.
*Flat Fee Pricing is for our Standard Service. Standard Service requires at least 5 business days to complete the serve(s). Anyone needing to be served faster than Standard Service is subject to a Rush Fee. All Flat Fee Pricing is per person, entity, and/or case. Except in the case of evictions, evictions are billed per unit and not per defendant. Metro Area Process Service $45.00 Milwaukee County, Dane County, Waukesha County, Racine County, Washington County, and Ozaukee County. Zone 1 Process Service $55.00 Columbia, Dodge, Green, Iowa, Jefferson, Lafayette, Rock County, and Sauk. 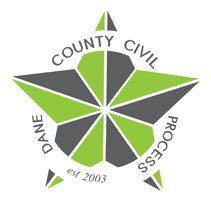 © Copyright Dane County Civil Process. All rights reserved.